Visitation will be 7-9pm, Saturday, March 25, 2017 at the Wallace-Thompson Funeral Home. Funeral services will be 2pm, Sunday, March 26, 2017 at the Sacred Heart Catholic Church, Rusk. 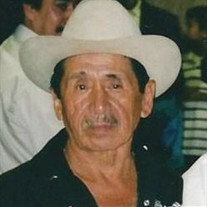 The family of Benito Rojo created this Life Tributes page to make it easy to share your memories. Send flowers to the Rojo's family.